"An unlikely attraction occurs between two passengers on a steamboat journey up the Missouri River to Montana...She is a self-centered young woman from a privileged family who fears the outdoors and avoids anything rustic. He is a preacher living under a sense of duty and obligation to love the unlovable people in the world. She isn't letting anything deter her from solving a family mystery that surfaced after her mother's death. He is on a mission to reach the rejects of society in the remote wilderness regions of Montana. Miss Fannie Rousseau and Reverend Samuel Beck are opposites in every way... except in how they both keep wondering if their paths will ever cross again." I have yet to read any of Stephanie Grace Whitson's contemporary novels, but I have always been pleasantly surprised after reading one of her historicals. A Most Unsuitable Match was no exception. I was immediately drawn to the characters, and really loved Hannah and Lamar. Even Stephanie's less important characters never feel insignificant, like Minette (and her echo) and Mrs. Tatum's compassion. Each one adds depth and purpose, as well as the Scripture she effortlessly weaves into the story. I must say that the burglary scene was unexpected. I was quite sure something more sinister was afoot... apparently not. I was also pretty sure I knew who Edie was. Although that part of the plot may sound predictable, the rest of the story was not. 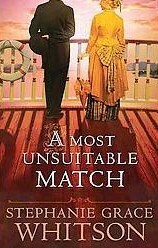 Combine steamboating, a young blind boy, Indians, a rich, spoiled girl learning how to sweep, a handsome French doctor, and you've got all of the right ingredients to keep me up until 1:00 am to finish A Most Unsuitable Match! It sounds like an excellent historical novel.